I didn't like the dream I had last night. Not one bit. I felt so disturbed by it that I actually woke up frowning, trying to analyze it. (Not that I don't analyze everything in the first place anyway). I don't remember the details but what was clear was that I was told that I am a boring person. At one point, I tried to argue and defend myself by insisting that none of that can't be true since none of my former students ever said that about me. (And please don't ask me for actual data but trust that I had good 'reviews' / decent results from students' evaluations). I even remember saying, "That doesn't make sense! People have always remarked at how animated I get when I speak!" In my dream, all my impassioned arguing didn't make any difference, and I lost. A boring person. That's how people thought of me and I never had a clue. I couldn't decide which one hurt my ego more: the fact that I was seen as boring, or that my self-definition was too incongruent from others' perception. Could this be true? Could I really have been walking around thinking I was someone fun to talk to, when in reality I'm generally considered dry and socially inept? 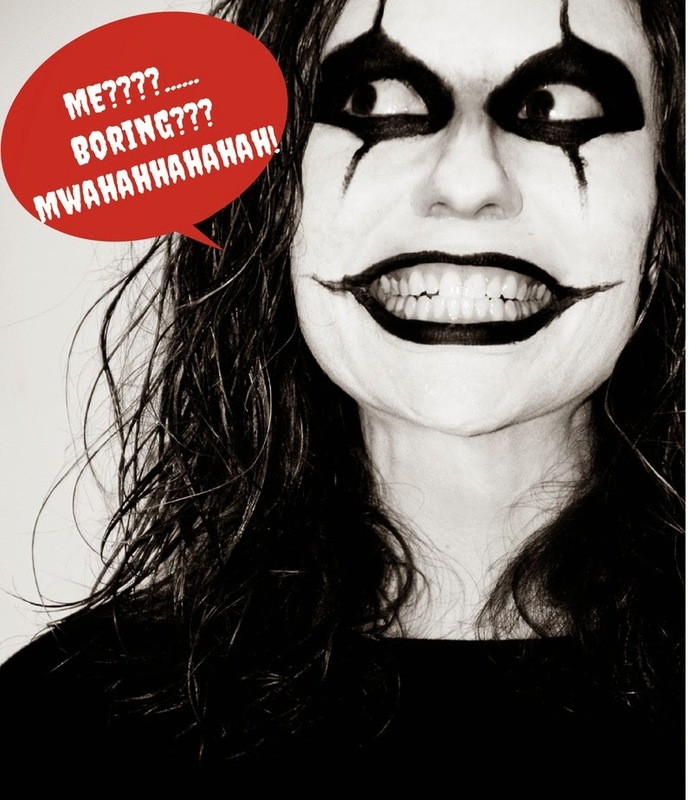 What does it really mean to be boring anyway? I admit that I don't have an exciting life. I'm an introvert at heart, and therefore derive no real pleasure from going out, meeting new people or exploring new experiences. All of the above simply cause me stress and leave me feeling drained, hence my preference for staying in or keeping the company of a small group of people I'm intimate with. I don't mind brief chit-chats, can manage to be friendly, and as I mentioned above, even animated, but only for a very limited amount of time. Because of all these factors, the truth is, my life is pretty predictable, even dull by most standards. To some, it might feel like a series of Groundhog Days, with one day feeling like a repeat of the previous ones. And believe it or not, I'm not complaining. I thrive in predictability. Small talk makes me tense and I hate it, even though I can fake it 'till I make it if it were absolutely necessary. Sure, it's great to meet new people every so often. But it's not something I would actively seek or bravely initiate. I think I've reached a stage in my life where I've simply become comfortable with the amount of true friends I already have and have given up all illusions of ever finding more. If it happens, then that's great. If not, no biggie. And sometimes I wonder too if that sense of resignation is influenced by the fact that I'm fairly new to this society; that I migrated here as an older adult and still feel a certain degree of alienation even after ten years. Sometimes I still wonder if I would've been more social, more willing to open myself up, if I were still in the Philippines with all that's familiar to me. I've always been on the shy, introverted side even as a child. Was it my migration and sense of alienation that heightened this trait? Or is it my aging, given that experts say aging heightens certain personality traits and more specifically the tendency towards introversion, especially among women? It could be my age. It could be my sense of alienation as a migrant. It could be both. But it really doesn't bother me at all that I have a very limited social circle. And frankly, I refuse to believe that this necessarily makes one a boring person. More importantly, I'm pretty sure my significant others don't define me as boring and that's really all that matters. I think once you've cultivated a deep and authentic relationship with someone, 'boring' loses significance. It's no longer so much about constantly injecting something new, but more about discovering what lies deeper beyond the surface layers. As a matter of fact, this coincides with my personal definition of 'boring'. To me, it's the inability or unwillingness to go deeper. You can be the busiest and most socially active person. But if you can't offer anything to me beyond your 'surface', then I'd still think you're boring. What's important to me is not how socially active a person is, but how deep and multidimensional they are or can be. It's the difference between reporting facts about what goes on in your life versus having the ability to glean insights from those events and dig deeper. And I believe that as people get older, their chances of acquiring that skill, that depth, become greater. I'd like to be optimistic that way! In other words, the good news is that as we age, the excitement shifts to what's going on in the mind, rather than merely in the realm of the external and superficial. How can that ever turn boring, right?! How do you define boring? Do you think your definition has changed through the years? I hate the word boring, because it is a label somebody else gives us. There is a big difference between being content with who you are and being boring. I'm sure there are people who may think my life and by extension I, am boring. But I'm really learning not to define myself by other's perceptions. Age is amazing for that!! Thanks for a great post! Aging does have its gifts! Thanks my friend! Most introverts I know are intelligent people who don't like to waste their time talking with or listening to people about things that don't concern them. The most boring people I know are the ones who always want to be in the spotlight, who go on and on, and consider themselves to be the most fascinating/brilliant/incredible ones in the room. Maybe that's why I've become "boring" and don't like going to social events. It's not your age, or that you're a migrant, but it's this society where the one who toots his/her trumpet the loudest is the one who gets all the attention. I agree Pennie! There's nothing more boring than egocentric people *sigh* Thanks for the wise words! I can't tell you how much I agree. Which is why I much prefer one-on-ones to being part of a group. I find people at their heart to be interesting. Their facade? Not so much. I completely agree. It's depth of character that makes a person interesting. And you have that in spades my dear! I wouldn't worry. I am incredibly boring too. That said, I like boring. Boring is good. I thrive in being boring. Boring means safe!! !